The global portable water purifiers market is estimated to surpass $124m by 2023 growing at CAGR 10.1% during the forecast period 2018-2023 majorly driven by the increasing water contamination coupled with rising need for safe and clean drinking water. Increasing trend of outdoor activities, and leisure trips associated with rising disposable income of the consumers will surely escalate the growth of portable water purifiers market. What is Portable Water Purifier? A portable water purifier refers to point of use water treatment system that can be carried to any place for proper water filtration. Portable water purification is a more convenient way to have drinkable water anywhere and will give tranquility as these are eliminating harmful impurities from drinking water. Moreover, these hand held units facilitates pure drinking water for travelers, military personnel and people going for recreational activities, camping, and trips. Portable water purifiers has numerous applications for filtering water from the various decentralized sources like rain water, wells, ponds, and many others, thus creating an intense potential for the growth of market. Water purification is based on the analysis of the physical, chemical, and bacteriological parameters and also requires customized apparatus with a trained personnel. The testing includes measurement of physical (pH, temperature, and conductivity), chemical characteristics (oxygen, nitrogen, and alkalinity), and analysis of biological activity. Therefore, innovative technologies plays a major role in addressing the various purification challenges and also responsible for sustainable path that supports the economic growth of the country. This report incorporates an in-depth assessment of portable water purifier market by type, filtration, applications, and geography. The major types of applications encompassed in the scope includes outdoor activities, residential apartments, remote municipal, disaster management, commercial complexes, and others. What are the major applications for Portable Water Purifiers? Portable water purifiers are self-contained, and hand-carried units majorly utilized by recreational enthusiasts, military personnel, survivalists, and also flexible to the people who have lack of access to water supply devices in many different developing countries. Since, past ten years, the market had a huge growth in offering water purifiers for residential and it is the dominating application among all the other applications. Increasing in the residential constructions will increase the usage of water purifiers which in turn will rise the market of the portable water purifiers. Currently, the water purification industry is witnessing huge demand owing to scarcity of fresh water and rising population. According to UN world water development report 2017, above 95% of wastewater in some least developed countries is released to the environment without treatment. Growing number of outdoor activities such as traditional and non-traditional triathlons, mountain and road biking, boardsailing along with the numerous participants will surely boost the global portable water purifiers market. APAC is an emerging market for the portable water purifiers owing to the rising disposable income of the people coupled with the rapid industrialization in countries like China and India. Moreover, China is investing approximately $300 billion funds into the waste water treatment technologies, thus enhancing the growth of market. According to World Health Organization (WHO), nearly 99% of the total deaths are occurred due to contamination of water across Asian and African regions. Therefore, the growth in the emerging markets continues to outweigh the growth in the developed regions. Many households in under developed countries consider water treatment as an unnecessary expense and mostly people believe that government is not prepared to invest in water quality improvement projects. Therefore, many governments are planning to take proper initiatives for better water treatment technologies, to meet the growing demand for water resources. 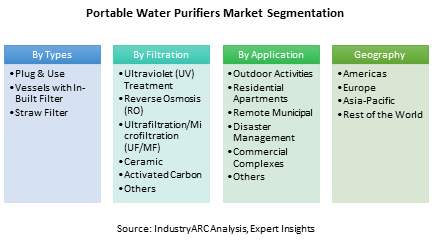 Who are the Major Players in Portable Water Purifiers Market? The companies referred to in the market research report includes MSR, Katadyn, Aquasana, Fairey Industrial Ceramics, Seychelle, and many others.